Claire has always had visions. Usually they turn out to be meaningless, but on her fifteenth birthday, Claire's grandmother gives her a mystical cameo necklace that heightens her powers. Claire's just started at a new school and befriended Becca Shuttleworth, heir to a huge fortune from her family's ketchup business. When Claire learns that the Shuttleworths have some enemies, she starts to put the dream clues together and gets caught up in a dangerous mystery. What I really liked about this story was the great characters. Claire has a really funny, sarcastic voice and a quirky French family. Becca is sassy and a little Goth, not your typical rich girl. Claire's grandmother Kiki is a former socialite who passes her designer dresses down to her granddaughter and throws parties for her at the Waldorf. These are interesting characters that I enjoyed getting to know. Also, once the mystery gets going, I started getting really hooked. Mechling builds some great tension as she reveals the truth behind the Shuttleworth fortune and some of the enemies the family has made. I'm not generally a fan of kids/teenagers as detectives, but I really believed in Claire's story, that she could find the clues and solve the mystery. Here's the thing, though... the book starts slowly. Now, I'm reviewing from an ARC so it's possible it might have changed by the publication date. But the first 100 pages or so dragged for me. Claire's coming back from a summer in France, starting at a new school, explaining how she was betrayed by her old friend Sheila... There are a few important elements to the story here, like getting the cameo from her grandmother, but I think the book would have been much tighter if it had been about 100 pages shorter. Those who persevere will find an intriguing mystery story, but I'm afraid some readers won't get through the rambling beginning. I would hand this one to middle-school mystery fans who like a splash of the paranormal. 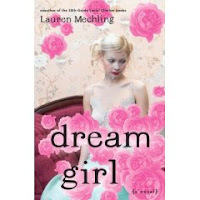 Make sure you check out Lauren Mechling's website (where we learn she went through a Harriet the Spy phase... I did, too! In the sixth grade I kept a spy notebook and wrote down mean things about everyone). Also, take a gander at an interview with Lauren on YA New York: Part I and Part II. Sounds like a good read. The cover is gorgeous, too.